A task force at the University of Texas at Austin has recommended guns be prohibited in residence halls, at sporting events and in certain laboratories. But the suggestions do not call for banning handguns in classrooms. A task force at the University of Texas at Austin has recommended guns be prohibited in residence halls, at sporting events and in certain laboratories. But the suggestions, issued in a report Thursday, do not call for banning handguns in classrooms. The report — drafted by a 19-member group of faculty, staff and students appointed by President Greg Fenves — included 25 suggestions for implementing the state's newly passed campus carry law, which goes into effect in August. "Every member of the Working Group – including those who are gun owners and license holders — thinks it would be best if guns were not allowed in classrooms," the report said. "Nevertheless, the Working Group does not recommend that classrooms should be designated a gun-exclusion zone." The campus carry law, passed earlier this year, allows license holders to carry concealed handguns onto public university campuses. Under the law, each institution is allowed to establish designated gun-free zones – as long as the zones do not encompass the whole university. Private universities may opt out of the law. Fenves said in a statement that he would study the report and "decide on our policy in the near future." Fenves' proposal is subject to approval by the UT System Board of Regents. The report also recommended prohibiting guns in areas where people receive counseling or medical care, the UT Elementary School on campus and places where disciplinary hearings may be conducted. It suggests that university staffers who have their own offices should be able to prohibit handguns in those spaces. In addition to designating gun-free zones, the report encouraged UT-Austin to create training materials for faculty, staff and students about how to respond to an active shooter situation and consider studying ways to improve mental health care offerings on campus. 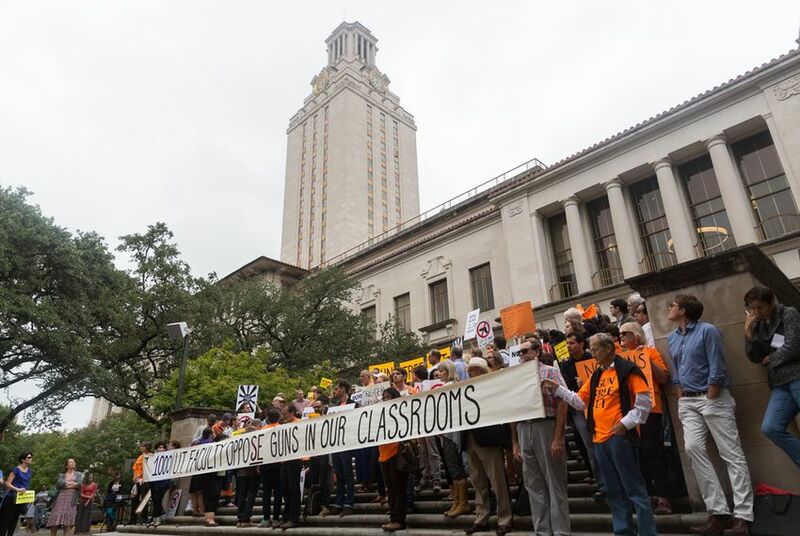 Faculty at UT-Austin have been vocal about their desire to keep handguns out of classrooms. Many have said the presence of guns would make them feel unsafe and could limit discourse among students. The school's Faculty Council recently passed a resolution against allowing guns in "classrooms, laboratories, residence halls, university offices and other spaces of education." Gun Free UT, a coalition of students, staff and parents from UT, has been vocal about their opposition to the campus carry bill and echo the Faculty Council's resolution. "We categorically reject the recommendation that guns should be allowed in classrooms," the group said in a statement released late Thursday. "The purpose of the university is education and the creation of new knowledge. Allowing guns in the classroom undermines that purpose by chilling free speech and infringing on academic freedom." The report stated that if the recommendations included a ban on guns in classrooms, the university would have to offer gun lockers at "strategic points around campus." Having lockers on campus "means that you're going to have lots of additional transfers of handguns into lockers," Steve Goode, chairman of the task force, told reporters in a conference call Thursday. "In particular, it's going to happen when people are on their way to classes and often in a rush and that is almost always a recipe for an accidental discharge. The risk with regard to safety outweighed any possible benefits that would accrue to ban guns in classrooms." The bill's author, state Sen. Brian Birdwell, R-Granbury, has argued that banning guns in classrooms would defy the purpose of the law. Last month, Birdwell asked Attorney General Ken Paxton to weigh in on where universities can legally prohibit handguns, citing concerns that banning guns in the classroom would discourage students from bringing their weapons on campus entirely. Goode said banning guns in dormitories would impact fewer students than a ban in classrooms. "The vast majority of our students live off campus," Goode said. "Only about 1 percent of our students who are eligible to get handgun licenses live in on-campus residence halls ... The entire student body would be affected by a prohibition on classrooms." The report comes a day after a gun rights group announced plans to hold a fake mass shooting demonstration near UT-Austin on Saturday. The university warned the group that if it holds the event — which is expected to include cardboard guns, fake blood and fake gunshot sounds — on campus, its members could be charged with criminal trespassing. UT-Austin is not the first public university to outline plans for implementing the law, and many are still debating their rules. On Wednesday, recommendations for the University of Texas at San Antonio were released. In addition to suggesting the prohibition of guns during sporting events, at on-campus voting sites and formal hearing rooms, the UT-San Antonio report said faculty and staff should have to participate in campus carry training. The task force at the Texas State University announced its recommendations in early November, encouraging university administrators to ban guns from areas where students seek counseling or children visit campus.